After stepping on the scale, I decided it was time to start making desserts that don’t call for Crisco as an ingredient. So, when I ran across this low-fat cookie recipe, I decided I must try it. I mean, how can you go wrong with cinnamon and sugar? The cookie is light, crunchy, and delicious. And, my apartment smelled so good while they were in the oven! I will definitely be making these again. Turbinado sugar is commonly known by the brand name Sugar In The Raw. After rolling the dough in the sugar mixture, I pressed the ball down with my palm to flatten it a bit. 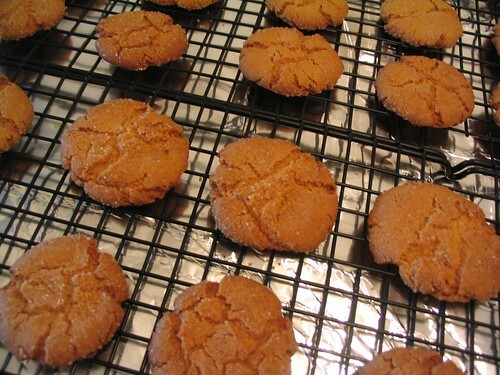 For a chewier cookie, reduce the baking time by a couple of minutes. These sound awesome. Thanks for the note at the bottom, I am not really a baker, and I had no idea what Turbinado sugar is. I also don’t keep cake flour on hand, I don’t think, no…just white flour. What is the difference? Do you have any idea what I can use as a substitute for egg? I love to come across a recipe for which I have all the ingredients at home already! (Well, except the raw sugar, but that’s easy enough to send the hubby to get!) Thanks. I love finding lighter recipe that actually get a stamp of approval. This recipe sounds great nad wholesome. Thanks for sharing it with us! yum! i’ve never baked with sugar in the raw before. very interesting! This was the first time I’ve baked with sugar in the raw too, and it added a really nice flavor and texture to the cookie! I just came across your blog. I am in love with my Kitchenaid Stand Mixer too. Seriously it is the most used appliance in my kitchen. I have the waistline to prove it. Another delicious looking recipe. I’ve never thought of using Sugar in the Raw to bake with… very interesting. I think I’ll give this recipe a try tomorrow! They sound delicious. I just finished baking these scrumptious cookies. My house smells heavenly and my taste buds are rejoicing! 🙂 These are sooooo good. Would it be OK with you if I post a photo on my blog along with the recipe and a link to your blog (of course giving you complete credit)? I made these yesterday and they were sooo good! They have such a unique flavor. My house smelled lovely while they were baking. I’m so glad I found your blog! I made these cookies yesterday and they turned out great. I didn’t have any cake flour so I used an AP substitution and they still tasted really good. I’m sure I never would have found this recipe from Cooking Light (I don’t usually turn to them for dessert ideas hehe), so thanks for posting this recipe. I posted a picture of how my cookies turned out along with credit and links to your blog and Cooking Light. Great site! Keep bakin’!